Both Assumption and St. Josaphat Churches have welcomed many new faces over the past few weeks. Because it can be a little confusing attending the Tridentine Mass in the beginning, it is appropriate to explain how things work. First, let’s get some terminology down. The “Tridentine Mass” is also referred to as the Traditional Latin Mass or “TLM”, the Classical Roman Rite, the 1962 Missal, and a variety of other names. It is the Mass as codified in 1570 after the Council of Trent, from which the adjective Tridentine derives. Following Vatican directives, we use the most recent version of this Mass, incorporating the minor changes introduced in 1962. 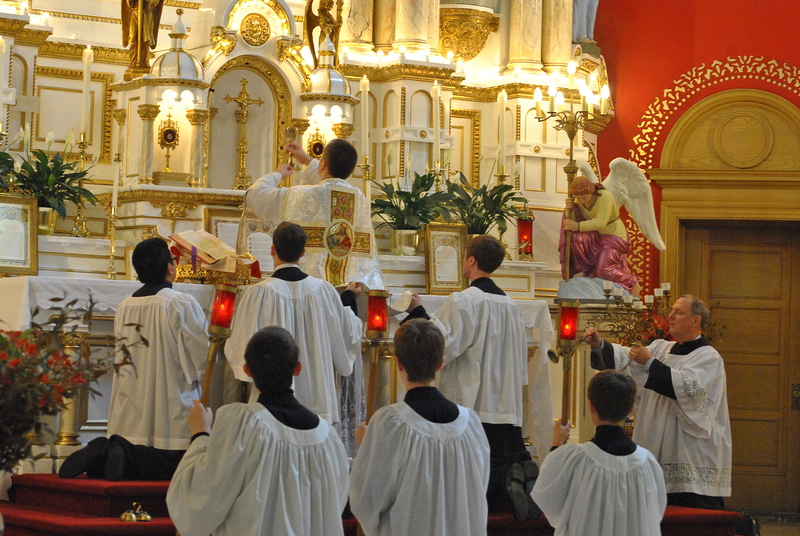 The Mass as experienced in most parishes today is referred to as the “Novus Ordo,” Latin for New Order of Mass. This liturgy was introduced in 1970. Other terms one hears include the New Mass and the Missa Normatíva. The Tridentine and Novus Ordo Masses have similar formats. The differences are in the details of the texts, the more detailed ceremonies, and the mandatory use of Latin and ad oriéntem (facing Liturgical East) posture of the priest. Red Missal: This paperback booklet contains the Ordinary, or unchanging prayers, of the Mass. It also contains some music in the back, as well as the prayers for Benediction of the Most Blessed Sacrament, which we hold approximately once per month after Holy Mass. Weekly Handout: These sheets contain the Propers, or unique prayers and readings, for the day. Hymn and music selections are specified in this handout, and some weekly announcements are printed on the back. Occasionally, music sheets are inserted into the handout. Blue “Traditional Roman” Hymnal: This book contains most of the music and hymns that we use. At Assumption Church only, we also occasionally make use of the red Ritual Song hymnals that are in the pews. Please return the Red Missals and Blue Hymnals to the back of the church after Mass. New copies of the Red Missals are available for sale for $5.00 each. They are handy tools to familiarize yourself with the Latin Mass. The Weekly Handouts are yours to keep. Even if you have a hand missal, you will need a Weekly Handout and Blue Hymnal for the musical selections of the week. We encourage you to join in singing the hymns and Gregorian Chant Mass settings as specified in the Handout. If music is specified, that means you are invited to sing. If only the title and composer of a piece are listed in the handout, that means the choir alone will sing the piece. As for the spoken parts of the Mass, you are also invited to recite the responses along with the altar servers. Many, but not all, people choose to let only the altar servers respond to the Prayers at the Foot of the Altar at the beginning of Mass, that is, up to the Kyrie. Beyond that point, the congregation customarily joins in all of the responses. Because much of the Mass is prayed silently by the priest, you may need to rely on visual cues or bells to help locate where we are. The Red Missal contains extensive commentary in the margins to aid you in this process. The Red Missal contains, for sake of completeness, the Propers for Trinity Sunday. For the other 51 Sundays of the year, you will need to refer to the Handout to see the Latin and English of that week’s prayers and readings. Keep the Handout and Red Missal close at hand to make it easy to bounce back and forth between the two references as the Mass progresses. For your first few Masses, you may find it more beneficial simply to observe the proceedings than to have your head buried in the printed page. The elaborate ceremony of the Tridentine Mass is a large part of its appeal, and should be appreciated on its own merit. Holy Communion is received kneeling at the Communion Rail, on the tongue. Do not say “Amen” before receiving the Sacred Host. If you have any questions about the Mass, we encourage you to ask one of your neighbors in the pews or the priest celebrant after Mass. Most everyone who attends the Traditional Latin Mass shares a deep love of the liturgy and will be happy to help you understand it better.